Sea fronted suite with the best sea vista, large veranda and a separate living room, complete with large Jacuzzi for two and outdoor garden shower..
Luxurious two-level sea fronted villa with complete sea vista, large veranda, living area, kitchenette, separate dressing room, and separate shower and Jacuzzi overlooking the sea. 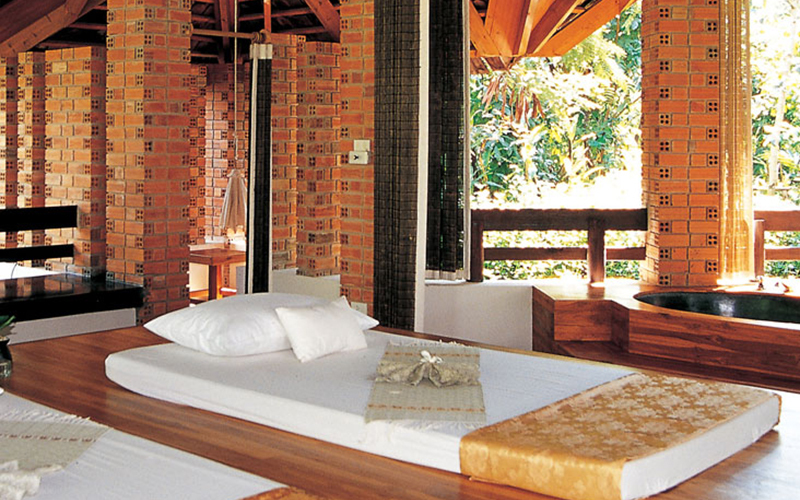 Serene tropical jungle atmosphere cottage with large veranda adjacent to running stream and waterfall, complete with Jacuzzis and shower overlooking the stream. The perfect cottage for those who savor the spa atmosphere. Located on the second and third rows from the seafront with garden view and partial sea view, complete with large veranda, garden bath and/ or shower; Some are family units with connecting doors. Perched along a small “khlong” overlooking a forest, complete with garden bath, and your very own private Classical Thai Style rowing boat. Our full-service spa offers a wide-range of pampered indulgence including a massage, body treatment, beauty salon, and features a fully equipped fitness center, steam rooms, sauna, Jacuzzis, chilled plunge pools, rock water fall pool – a natural relaxation area, spa boutique, a spa cuisine with seating overlooking our breathtaking garden of various ancient trees. The gorgeous colors of sunsets dipping below the horizon, the soft lapping of the waves, and the privacy of the long stretch of sand all conjure up romantic thoughts that are an inspiration for the most important event in your life: your wedding. All of this can be real. Let the rays of the sun glinting over the water creating beautiful auras mesmerizing your true love and you. Feel the freedom of the open air and the exhilaration of the water stretching out before you.